Pinwheel quilt blocks are the basis for many quilting patterns. Free pinwheel quilt templates are easy to download and print in any size. 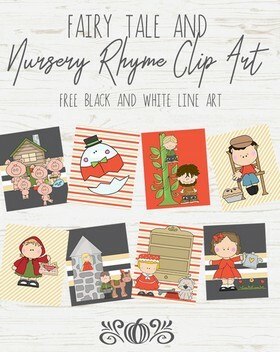 Use the basic pinwheel to make a quick and simple baby quilt or lap quilt that's ready in no time. Pinwheel pattern variations can be used to make many home decorating projects. Click on the image for the printable 6" block of the Pinwheel quilt pattern. Use the pattern to make table runners, placemats, Christmas tree skirts or to design a quilt for your bed. 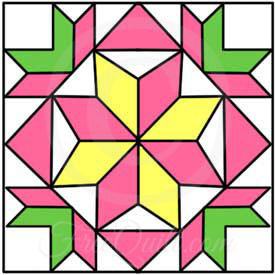 Click on the image for the printable 6" block of the Pinwheel Star Quilt Pattern. Can't Stop Spinning, Flying Kite, Wheels and Grandma's Choice are just a few of the variations available. Use with a coordinating sashing and border to create a colorful quilt that's sure to be a family favorite. Here is a nine inch block that is great for July 4th or just showing your patriotism. The good ole red, white	& blue. Let your imagination and creativity come alive when picking colors and prints for each month to make this	pinwheel BOM quilt. Easy and breezy pinwheel quilts are not only attractive and eye catching but are also bursting with colors. 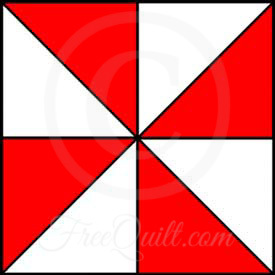 This easy pinwheel quilt block is assembled with one simple little unit that's sewn in different color	combinations.